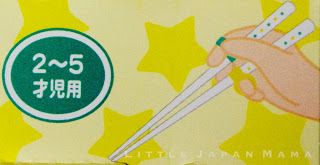 More than just learner chopsticks, this is a gorgeous pair of bento chopsticks with a yellow and green star design. These chopsticks come with a set of removable silicone training rings. Just slip the tip of your index finger into the green ring and hold that chopstick between your index finger, middle finger and thumb. Slip your ring finger into the yellow ring as shown in the diagram and off you go! 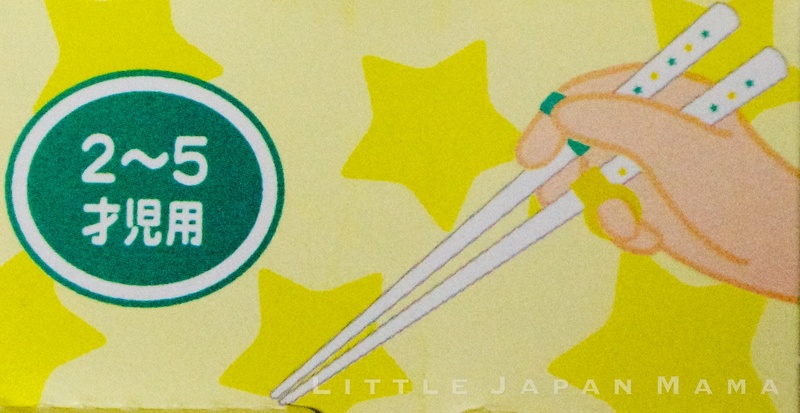 When you've become a chopstick pro, remove the rings and enjoy your cute bento chopsticks! They are not as easy for little kids to use as the Training Chopsticks - Bear Hinge, so for really little kids I would start with those. It says it's for 2-5 years, but I would say 4 years+, my two-year old just can't get the hang of these.